1. Wash the grated potato two or three times till water becomes clear. 2. Strain the water completely. 3. Add milk and pressure cook till one whistle. 4. Mix 1/4 cup of water to sugar and boil it in a heavy pan till one string consistency is reached. 5. Add kesar colour, cooked potatoes and stir till halwa consistency is reached. 6. Fry cashews, raisins in ghee. 7. Add before removing from fire along with rest of the ghee. 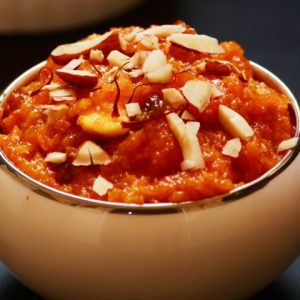 Feel free to comment or share your thoughts on this Potato Halwa Recipe from Awesome Cuisine.